Södra has management systems certified in accordance with ISO 9001 and ISO 14001. It conforms to the procedures and expertise required of quality and environmentally certified companies throughout the world. Södra is also certified according to energy management system ISO 50001 and OHSAS 18001, which is a standard for occupational health and safety management. Continuous improvement is necessary to maintain certification – we have to work in a systematic and goal-oriented manner to achieve our short and long-term goals. It assures our customers of our commitment to sustainable development of our community and our natural world. Södra uses two systems for forest certification of member forest property - PEFC™ and FSC®. 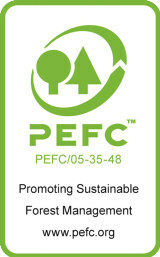 Södra Cell has Chain of Custody certificates from PEFC and FSC for delivery of certified products. Our certifications are quality-assurance measures of our expertise as well as our credibility. They are proof that we maintain a high level of awareness in our current and future products. The document/s on this page require/s Adobe Acrobat Reader installed on your computer. If you do not have Adobe Acrobat Reader, please click here. PEFC available on request. FSC available on request.